Our readings this Sunday speak to us about the need to be always ready -- for the end of our own life as well as for the end of times when the bridegroom (Jesus) will come in the night. Our readings contrast the wise with the foolish. Our first reading (Wisdom 6:12-16) presents the Wisdom God in the feminine sense. Thomas Merton calls it Hagia Sohpia (Greek for Holy Wisdom). Merton says, "She is God-given and God himself as Gift. Sophia in all things is the Divine Life reflected in them." Today's reading is a beautiful poetic depiction of the presence of God as "resplendent and unfading" and "found by those who seek her." Our Gospel reading (Matthew 25:1-13) presents the parable of the ten virgins, representing the Kingdom of God at the final judgement. Five of the virgins were wise and the other five were foolish in not having enough lamp oil for when the bridegroom comes. In our Epistle reading (1 Thessalonians 4:13-15), we learn that hope is not a wish, it is an expectation, founded in our faith and the love that Jesus has for us and us for him. St. Paul gives us hope in two things: That Christ will come again and that we (and those who have fallen asleep) will rise with him into a new life eternal. 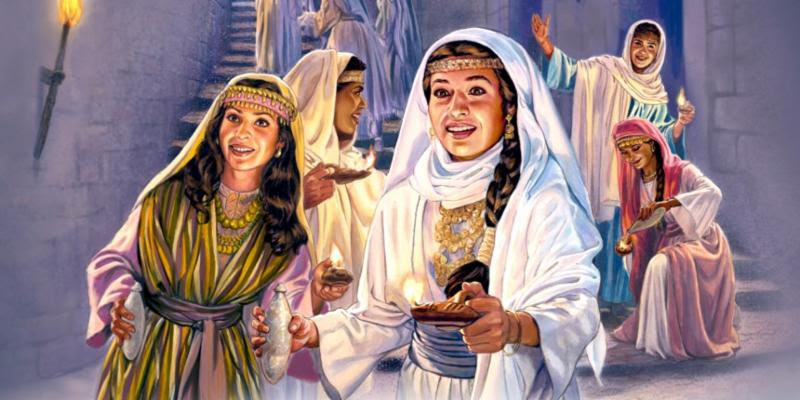 It is not that the wise virgins were selfish IN not wanting to share the oil from their lamps. It can be said that the oil represents all the good works of mercy and justice and faithfulness required of believers. These good works are not transferable. They can only be acquired by each person through individual acts of love. When the Lord comes at the end of our own life, will we have enough oil in our lamp, enough good works stored to light our way to eternity? This truly separates the wise from the foolish.